bl.uk > Online Gallery Home	> Online exhibitions	> Asia, Pacific and Africa Collections	> Panduah. Golden Mosque. 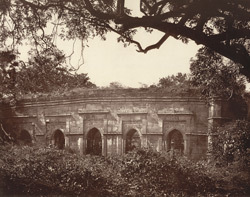 Photograph taken in the 1860s by John Henry Ravenshaw, one of 45 prints in the album 'Gaur: Its Ruins and Inscriptions'. Pandua, near Gaur in the Malda district of Bengal, was a centre of provincial Islamic culture, reaching its apogee when it supplanted Gaur as capital of Bengal from 1342 till the beginning of the 15th century. Nur Qutub Alam was a 15th century Sufi saint (d.1415) in whose honour the Qutub Shahi Mosque (or Golden Mosque or Sona Masjid) was erected in Pandua in 1582 by Sultan Makhdum Shah. Of this view of the east façade of the Qutub Shahi mosque Ravenshaw wrote: 'North of Qutb's house stands a small but beautiful mosque, called the Sona Masjid, or Golden Mosque, built throughout of Hornblende. There is a courtyard traceable to the east with a massive gateway...' The mosque is faced with stone and has five entrance arches. Originally the roof was surmounted with ten small domes and the minarets were glazed with yellow tiles.